There is no need to debate the pros and cons of holding a New Year’s Day march this year. The Yuan Dan 【元旦】- Day One of the New Year – march is an on-again off-again tradition, depending on the mood of day and issues at hand. In 2015, there was no march because everyone was still recuperating from the just-ended 79-day Occupy street blockades. The February First substitute was a low-key affair, as though everyone was still resting up. Last year, a few energetic souls came out on their own. But no sooner had the traditional Civil Human Rights Front organizer decided against a 2016 New Year march than Causeway Bay Books manager Lee Bo mysteriously “disappeared” into a van near his warehouse office, sparking a spontaneous protest days later (Jan. 7, 2016 post). 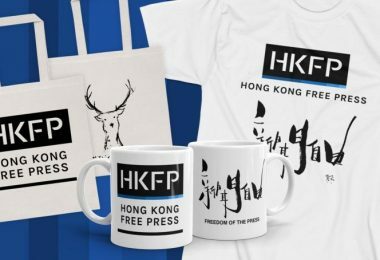 It was just the beginning of his brush with mainland law enforcers bent on suppressing Causeway Bay Books’ cross-border sale of political publications banned in China but not in Hong Kong. Lee’s experience and that of his colleagues, five in all, would add another dark dimension to Hong Kong’s mood in 2016. There are now several others. 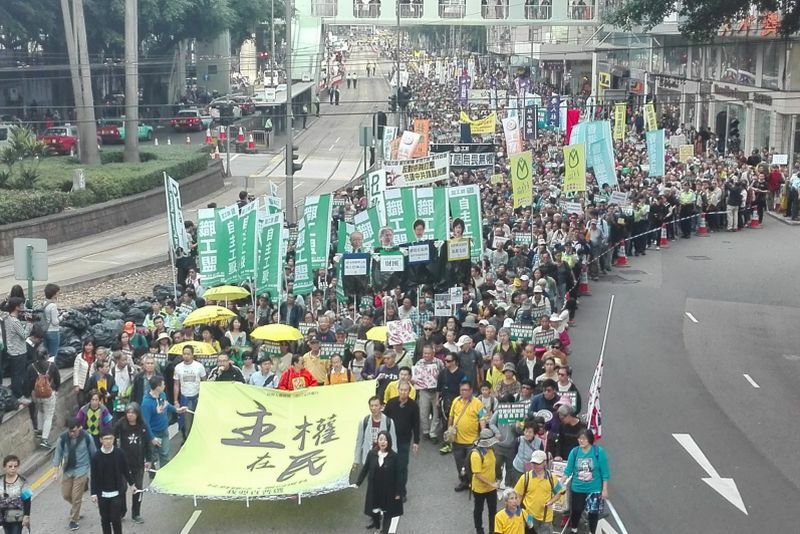 During 2016 the Beijing-Hong Kong disconnect intensified, making the need to march an urgent necessity. There were several steps along the way: from Occupy in 2014, to the 2015 District Councils election, the 2015-16 case of the disappearing booksellers, the 2015-16 splash made by the futuristic political docu-drama Ten Years, the February 2016 Mong Kok riot, the February 2016 New Territories East by-election, and on to the September Legislative Council election, and the oath-taking saga that has already seen the disqualification of two new legislators and is ongoing. 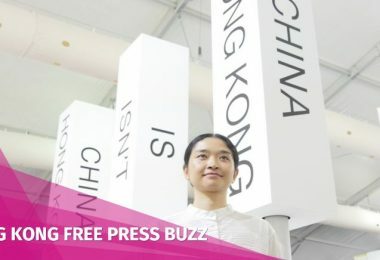 Each step has strengthened Hong Kong’s growing climate of dissent, pushing back against Beijing’s growing intrusions into local political life. Consequently, the January First march was billed as a fund-raiser to help cover the legal costs of four more recently-elected legislators. 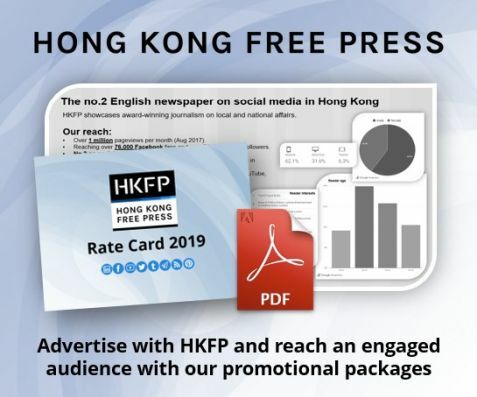 The aim is to try and block what has become an official attempt to use Beijing’s new loyalty-oath criteria to nullify the effects of Hong Kong’s September 4 Legislative Council election (Sept. 8, 2016 post). Reinforcing tensions throughout has been the new conclusion that grew out of the Occupy consciousness-raising experience. 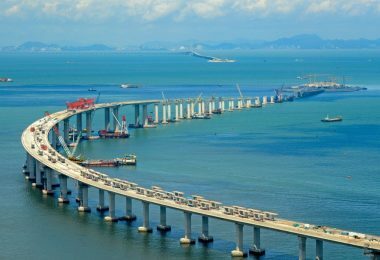 This conclusion was that Beijing has no intention of ever allowing the kind of political autonomy Hong Kong thought it had been promised by all the assurances and documents that accompanied the transfer of sovereignty from London to Beijing in 1997. Whether Beijing officials subsequently changed their minds or have simply been speaking a different political language all along is open to debate. The latter seems more likely. But the more urgent question now is how best to confront present realities. Activists have begun exploring a variety of potential solutions. But the idea that has sounded the loudest alarm in Beijing is “independence” and Beijing has chosen to tar all the new post-Occupy solutions by whatever name… whether localism, separatism, self-determination, or independence… with the same brush. 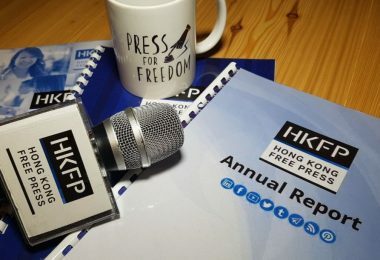 To their credit, those officials have chosen to handle what they see as this most grievous of challenges to Beijing’s jealously-guarded sovereign right to rule, not by calling out the tanks, but by trying to turn Hong Kong’s Basic Law constitution to the same purpose, namely, to kill those ideas. In the process, of course, they’re not just striking a blow at what Beijing regards as subversive ideas. 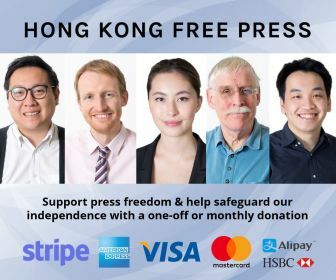 Collateral damage includes the principle of free elections, plus Hong Kong’s own most jealously-guarded source of protection, namely, its judicial independence. Beijing’s loyalist allies tried but failed to block the new post-Occupy ideas during last September’s Legislative Council election. So Beijing is now trying to do the next best thing: attempting to nullify the results of that election by disqualifying newly-elected legislators on the basis of loyalty oath criteria. 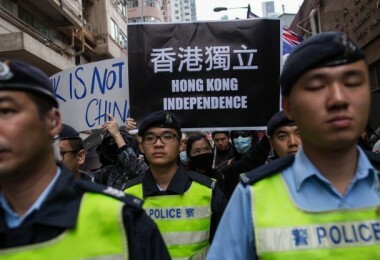 A protester holds a placard reading “Against Hong Kong independence”. Photo: Dan Garrett. A few candidates had already been barred from contesting the election on the same grounds via a new confirmation oath (July 22, 2016 post). The next more dramatic opportunity arose during the October 12 swearing-in ceremony when two of the most radical new legislators chose to reword their oaths in a deliberately insulting manner. Asked to repeat then and there by the presiding officer, they did, in the same manner. The two are Sixtus Baggio LEUNG Chung-hang 【梁頌恆】, elected from New Territories East, and Yau Wai-ching 【游蕙禎】from Kowloon West. Both are members of the new post-Occupy political group Youngspiration 【青年新政】 (Nov. 3 post). Beijing’s political wrath has thus been brought down on everyone’s head. The Hong Kong government, ever eager to please, asked for a judicial review to determine whether the two should be allowed to re-take their oaths again. This the Legislative Council’s presiding officer had agreed to let them do, following customary procedures. But pro-establishment legislators, who are in the majority, walked out of the chamber making the necessary quorum impossible to muster for a repeat oath-taking by the two. On November 15, the results of the judicial review were announced. The Hong Kong judge ruled that the two must be disqualified for their failure to take the oath properly. Nor should they be allowed to retake the oaths as had initially been promised by the Legislative Council’s president (case: HCAL 185/2016). Yau Wai-ching outside the High Court. Photo: Chantal Yuen. Judge Thomas Au said he made his decision on the basis of Hong Kong law and precedent alone, but it’s tempting to contemplate the consequences had he ruled otherwise. Because his Nov. 15 judgement had been preempted by a November 7 ultimatum from Beijing. Another Hong Kong judge, Andrew Cheung, subsequently reminded everyone, in a November 30 appeal court ruling, that Hong Kong courts are bound to respect such judgements from on high (case: CACV 224/2016). Judge Cheung was referring to the fast-track interpretation of Hong Kong’s Basic Law Article 104 on oath-taking issued by Beijing on November 7. This made matters much worse. 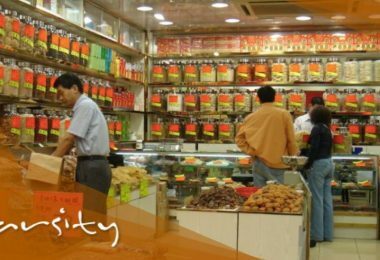 It proclaimed new requirements for solemnity, sincerity, and loyalty not just to Hong Kong but explicitly to the People’s Republic. All this the Hong Kong appeals court then reaffirmed in the November 30 judgement. 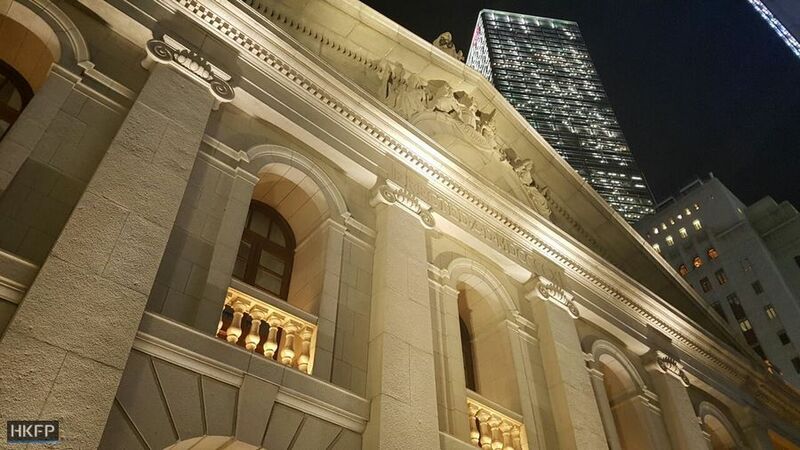 It also helped Beijing out by ruling further that unlike Hong Kong’s common law conventions, Beijing’s interpretation should be implemented here according to Beijing legal custom, which mandates retroactive enforcement. That signaled the green light for more to come. The Hong Kong government, led by outgoing Chief Executive Leung Chun-ying, went back to its judges in search of a ruling that will punish four more newly-elected legislators. 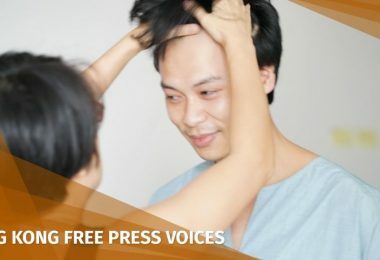 The Hong Kong court is being asked whether they should be disqualified due to their loyalty oaths, which did not meet the new standard Beijing laid down after they took them. The oaths of all four were initially accepted by the presiding officer, with two being permitted to retake. All four are currently sitting as duly-elected and sworn-in Legislative Councilors. The government’s challenge is taking place in the form of judicial reviews … which mean the legislators need to defend themselves in court. 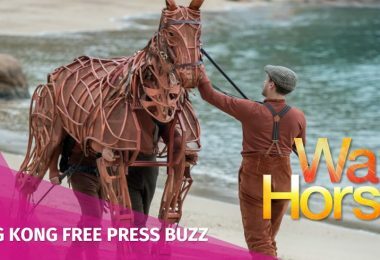 There will be court costs and if they want professional representation they need to hire lawyers, not all of whom will likely be willing to work pro bono … all of which means something to the tune of HK$5 million. The government has unlimited resources. These legislators don’t. Hong Kong’s judicial independence comes with a hefty price tag. Hence the need for this year’s New Year’s Day march. It was a fund-raiser for the four newly-threatened legislators. The original two, who are now disqualified, are taking their case on to Hong Kong’s highest Court of Final Appeal. 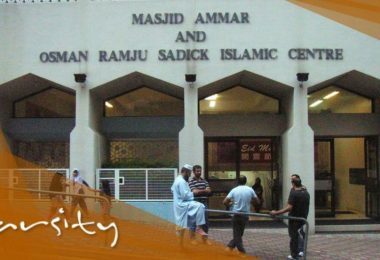 Fund-raising for them is separate. 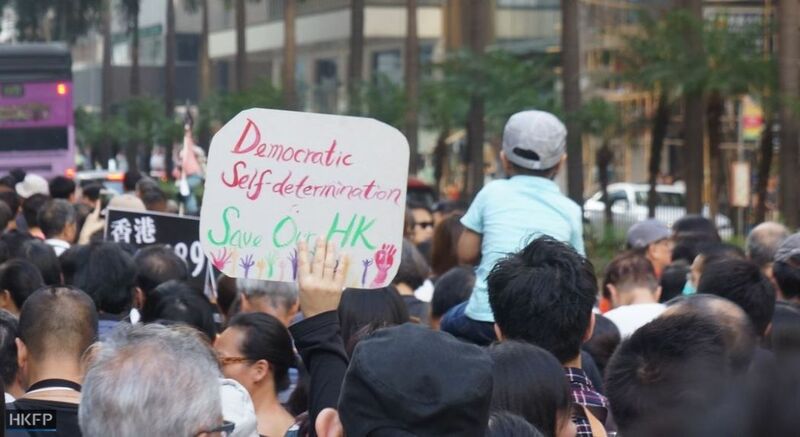 Sympathetic legal advisors, more concerned about the precedents being set that threaten Hong Kong’s judicial independence than the fate of the two legislators, are hoping to muster stronger arguments than were used in the two previous attempts at defense. 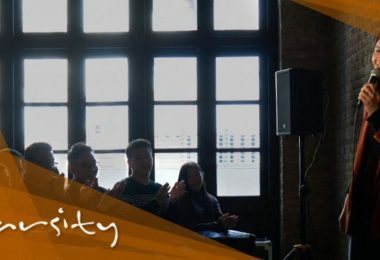 The four legislators: LAU Siu-lai, 【 劉小麗】, teacher, street-market campaigner, and democracy activist from Kowloon West; Nathan LAW Kwun-chung 【羅冠 聰】, student activist, from Joshua Wong’s Demosisto party, representing Hong Kong Island; Edward YIU Chung-yim 【姚松炎】, a Functional Constituency legislator; and surprisingly, an old-timer who has disrupted many a solemn ceremony in his day, “Long Hair“ LEUNG Kwok-hung 【梁國雄】, from New Territories East. 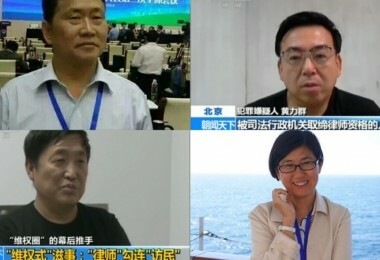 Edward Yiu, Leung Kwok-Hung, Lau Siu-lai and Nathan Law. Photo: Inmedia. The government is basing its challenge on Beijing’s November 7 interpretation, which goes well beyond the original bare-bones Basic Law Article 104 requirements for oath-taking. 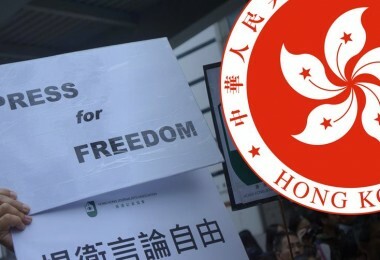 In the newly interpreted version, legislators and all leading officials must not only pledge allegiance to Hong Kong but also to the People’s Republic. They must also do so “sincerely, solemnly, accurately, and completely.” And there can be no re-do, no second chance. Actually, by these new standards, the government should be seeking to disqualify many more than just four. The unexplained selective choice of these four to the exclusion of others, suggests that politics is playing as much of a role as the new loyalty oath criteria. 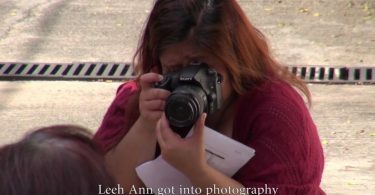 Nathan Law is accused of a voice inflection. 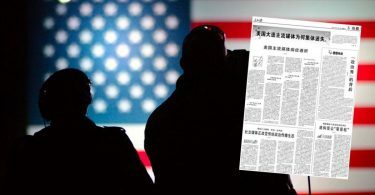 He raised his voice as if asking a question when he repeated the words “People’s Republic of China.” Teacher Lau read out her oath in slow motion. She later posted a note on her Facebook page saying she had done so to make the oath as meaningless as possible. Functional Constituency legislator, Edward Yiu, represents Chief Executive Leung Chun-ying’s architectural, surveying, and landscaping sector and is its first pro-democracy representative. While taking his oath, Yiu interjected that he was also declaring for procedural justice and genuine universal suffrage. Nathan Law. File Photo: Tom Grundy/HKFP. Most curious of all, however, is the case of “Long Hair“ Leung Kwok-hung. His oath-taking performances date back to 2004 when he was first elected to the Legislative Council. His January First marching day flier proudly advertised these performances beginning with the story of his attempt to compose his own oath in 2004 (Nov. 30, 2016 post). 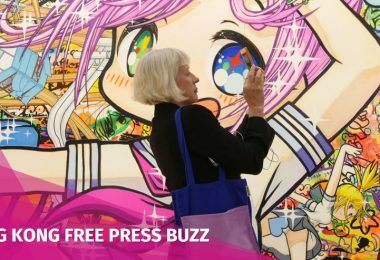 He himself had applied for a judicial review in order to clarify his rights after the Legislative Council’s clerk rejected a draft of the version he wanted to take. Judge Hartman did the same. He ruled that Leung must conform to Legislative Council procedures or lose his seat (case: HCAL 112/2004). 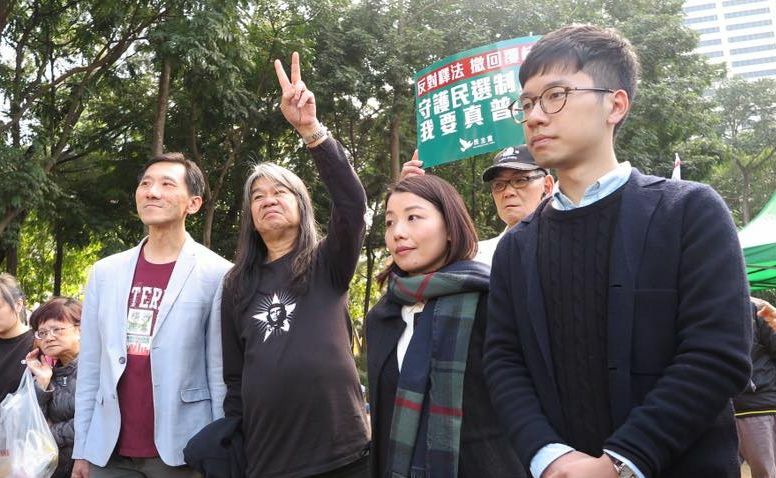 Ironically, it was this 2004 precedent ruling on Long Hair’s question that Judge Au cited in his November 7 decision disqualifying Baggio Leung and Yau Wai-ching for their creativity. As for Long Hair in 2004, he took his oath as required but used the opportunity to shout out his favorite slogans before and after. He also wore one of his favorite T-shirts … emblazoned with a slogan calling on Beijing to reverse its verdict on the 1989 occupation of Tiananmen Square【平反六四】. That verdict and the counter-revolutionary label that came with it was used to justify the June Fourth crackdown and the slogan has been a staple of rallies ever since. Leung Kwok-hung during the swearing-in session. Photo: LegCo video. In 2008, he again wore the T-shirt and shouted out slogans before and after his oath-taking. 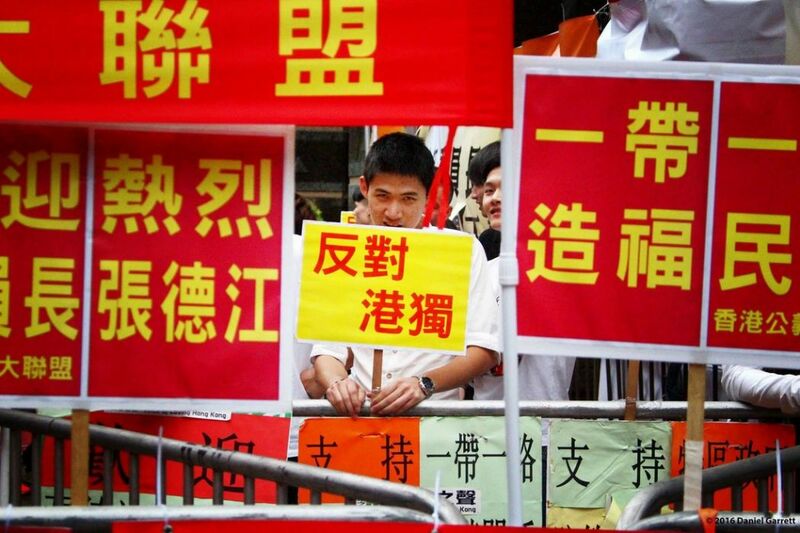 In 2012, he repeated his performance adding slogans about universal suffrage and universal retirement protection. But last year, 2016, his T-shirt bore the words “civil disobedience 【公民抗命】 and Leung shouted out for democratic self-determination 【人民民主 自決】. 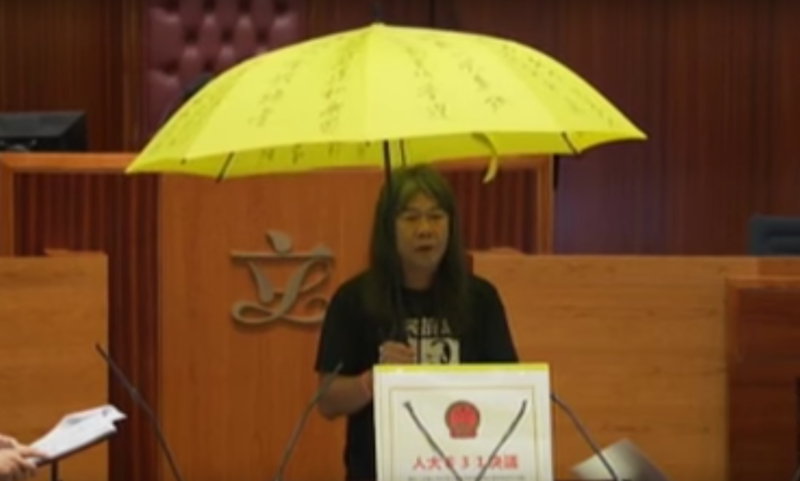 He also opened a Yellow Umbrella, symbol of the 2014 Occupy protest, while reciting the oath. 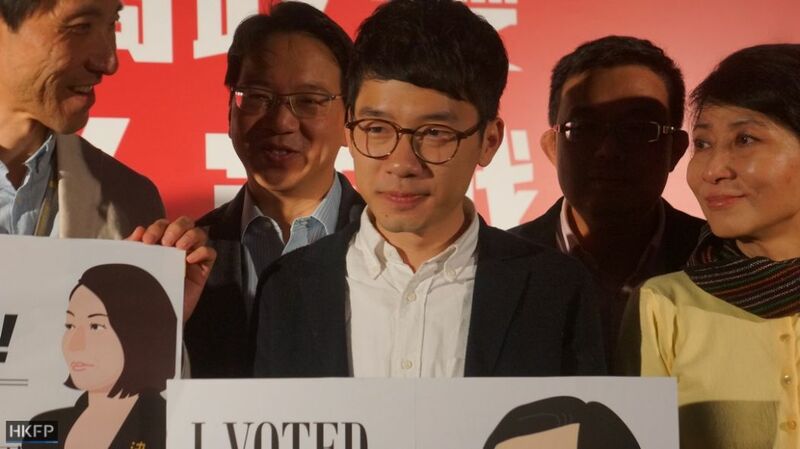 Perhaps his “King of Votes” title won for receiving more than anyone else, plus the case of rural influence-peddling he publicized, protected him, for now, from the government’s attempt to disqualify the new post-Occupy breed of activists. 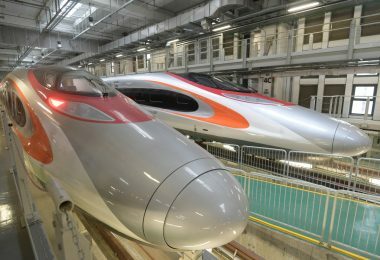 Beijing’s tough love for its Hong Kong compatriots may succeed in discouraging demands, such as they are, for independence. But if so, there is as yet no sign of acceptance for Beijing’s rules and definitions. Beijing and loyalist commentators never cease repeating that independence and self-determination are one and the same. Even Hong Kong’s former governor and champion of democracy, Chris Patten, agrees with them (Nov. 30 post). 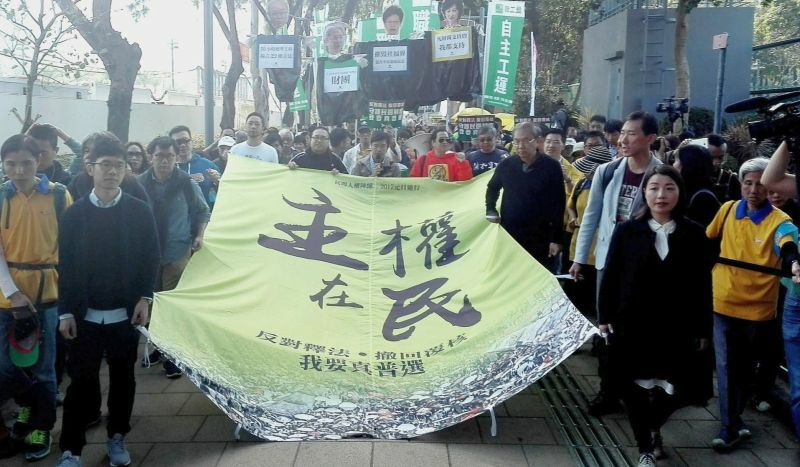 Undeterred, the lead slogan selected for last Sunday’s march proclaimed: “Sovereignty to the People” 【主權在民】. There were plenty of self-determination 【自主】 slogans as well. But nothing about independence. 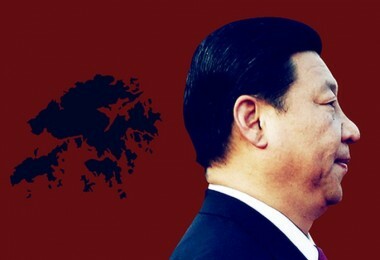 Hong Kong is trying to draw a distinction but Beijing is so far not of a mind to listen. Turnout was not what the organizers had hoped, however. Just over 9,000 by their own count. The police as usual cut the number down by half. Perhaps people were tired of marching for the same cause since several thousand more had already come out, spontaneously, just two months before, on Sunday November 6, a day ahead of Beijing’s interpretation announcement. But New Year’s Day was first and foremost a fund-raiser and the proceeds were good. 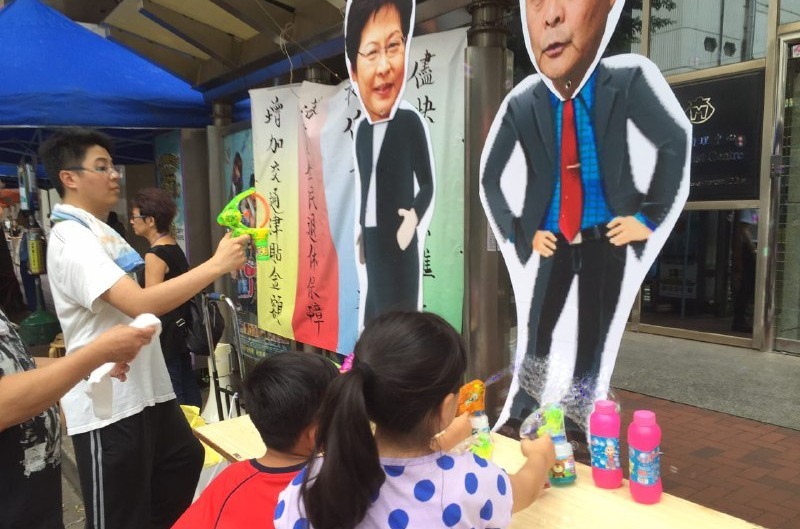 Donation boxes set up all along the route from Victoria Park to downtown Central, collected HK$1.42 million. Total in the new Justice Defense Fund is now HK$1.83 million. 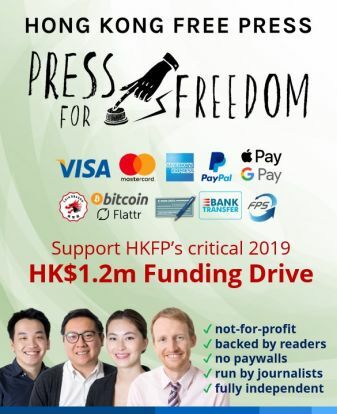 Not bad, but not good enough and still well short of the HK$5 million target needed to match the government’s unlimited resources. Enthusiasm was nevertheless high, especially at the main platform set up outside the Wanchai subway station. Manning this collection point on their old perch were the three original Occupy Central organizers: Professors Benny Tai and Chan Kin-man, with Reverend Chu Yiu-ming, back together again for this new cause. They’re managing the Justice Defense Fund along with veteran candidate coordinator and universal suffrage alliance builder, Prof. Joseph Cheng. 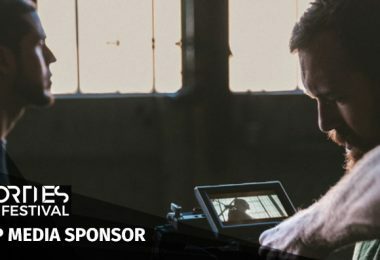 He counsels “tolerance and patience” whenever someone in an audience uses unprintable language while asking a question about the Younspiration duo who launched the oath-taking saga on October 12. Tai, Chan, and Chu were the center of attention: revived, slimmed down, energetic, and evidently fighting fit for this next round in their long-running struggle. But the biggest surprise was Reverend Chu whose days on the front line extend all the way back to 1989. 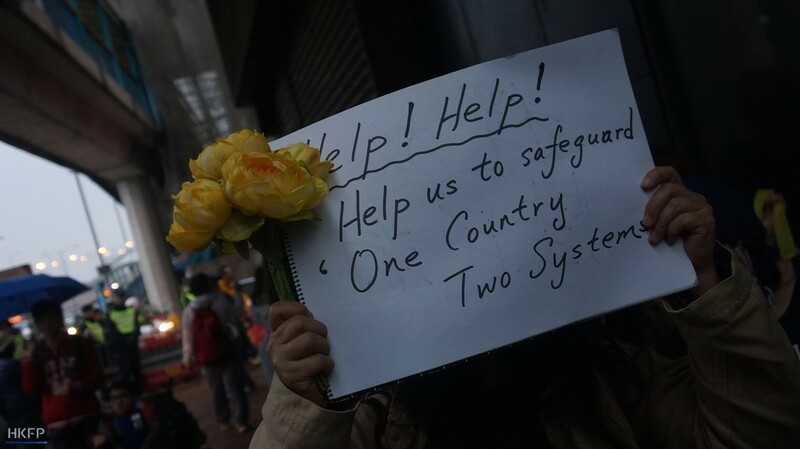 Two years ago after the Occupy barricades were finally cleared, Chu said he was tired and unwell, and Occupy had been the last campaign for an old soldier. He wanted nothing more than to live peacefully in quiet retreat. That was then. Two years later, he’s back. It’s not over yet… and obviously neither are any of them.